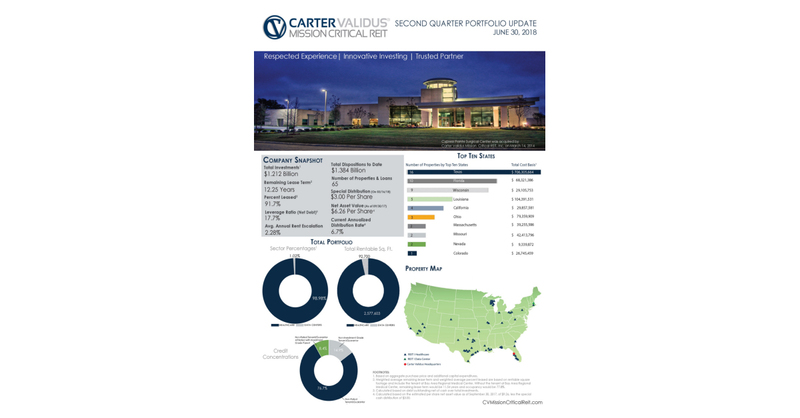 TAMPA, Fla.–(BUSINESS WIRE)–Carter Validus Mission Critical REIT, Inc., or the Company, announced today its financial and operating results for the quarter ended June 30, 2018. Net income attributable to common stockholders totaled $5.6 million. Net operating income from continuing operations, or NOI, totaled $14.2 million. Funds from operations, or FFO, as defined by the National Association of Real Estate Investment Trusts, or NAREIT, attributable to common stockholders equaled $7.8 million. Modified funds from operations, or MFFO, as defined by the Institute for Portfolio Alternatives (formerly known as the Investment Program Association), or the IPA, attributable to common stockholders equaled $6.6 million. The Company sold four real estate properties for an aggregate sale price of $88.2 million. An explanation of Funds from Operations, Modified Funds from Operations and net operating income, as well as reconciliations of such non-GAAP Financial measures to the most directly comparable U.S. GAAP measures, is included at the end of this release. Net income attributable to common stockholders totaled $5.6 million for the quarter ended June 30, 2018, compared to $12.2 million for the quarter ended June 30, 2017, or a 54% decrease. FFO attributable to common stockholders equaled $7.8 million for the quarter ended June 30, 2018, representing a decrease of 74% compared to FFO attributed to common stockholders of $29.5 million for the quarter ended June 30, 2017. MFFO attributable to common stockholders equaled $6.6 million for the second quarter of 2018, representing a decrease of 74% compared to MFFO attributable to common stockholders of $25.3 million for the quarter ended June 30, 2017. During the second quarter of 2018, the Company paid aggregate distributions of $19.3 million ($10.1 million in cash and $9.2 million reinvested in shares of common stock pursuant to the DRIP). The Company declared distributions per share of common stock in the amount of $0.10 for such period. The reductions in net income, FFO and MFFO compared to the same period in the prior year are primarily the result of the Company selling substantially all of the data center properties during the fourth quarter of 2017 and the first half of 2018, and no longer having the related rental revenue of those properties, as well as a significant tenant of the Company, Bay Area Regional Medical Center, LLC, or Bay Area, experiencing financial difficulty. During the second quarter of 2018, Bay Area, which occupied the Bay Area Regional Medical Center property, defaulted on its lease and loan obligations and ceased paying rent and loan interest. On August 10, 2018, the Company announced that an affiliate of the University of Texas System entered into a non-binding letter of intent to lease the Bay Area Regional Medical Center property. On August 13, 2018, the Company, through its wholly-owned subsidiary, terminated its lease with Bay Area, as more fully described under “Portfolio Overview and Leasing Activity” below. The Company successfully completed its strategy to monetize its data center properties, inclusive of a sale of one property in July 2018. The Company generates almost all of its net operating income from property operations. In order to evaluate the overall portfolio, management analyzes the net operating income of same store properties. The Company defines “same store properties” as operating properties that were owned and operated for the entirety of both calendar periods being compared and excludes properties under development. By evaluating the property net operating income of the same store properties, management is able to monitor the operations of the Company's existing properties for comparable periods to measure the performance of the current portfolio and determine the effects of new acquisitions on net income. See the reconciliation of net income, which is the most directly comparable GAAP financial measure, to net operating income for the three months ended June 30, 2018 and 2017 included at the end of this release. Total second quarter of 2018 revenue from continuing operations of $17.2 million was a 34% decrease from total revenue from continuing operations of $25.9 million for the same period in the prior year. Second quarter of 2018 same store rental revenue and tenant reimbursement revenue of $17.0 million was a 26% decrease from same store rental revenue and tenant reimbursement revenue of $23.1 million for the same period in the prior year. Non-same store rental revenue and tenant reimbursement revenue totaled $15,000 for the quarter ended June 30, 2018, as compared to $2.7 million for the quarter ended June 30, 2017. NOI from continuing operations totaled $14.2 million for the quarter ended June 30, 2018, representing a decrease of approximately 39% compared to NOI from continuing operations of $23.4 million for the quarter ended June 30, 2017. The reductions in revenue and NOI are primarily attributable to Bay Area defaulting on its lease and loan obligations, and the loss of rental income as a result of the sale of the Miami International Medical Center property, which the Company sold in December 2017. As of June 30, 2018, the Company owned 30 real estate investments (excluding one real estate investment classified as discontinued operations), consisting of 61 properties, comprising approximately 2,357,000 of leased rentable square feet. The Company’s real estate investments are located in 33 metropolitan statistical areas, or MSAs. The Company's operating real estate properties had a weighted average occupancy rate of 91% as of June 30, 2018. At June 30, 2018, two of the Company's operating real estate properties were vacant. During the second quarter of 2018, the Company had 217,000 square feet of vacant rentable space and had no leasing activity. As of June 30, 2018, the weighted average remaining lease term of the Company's real estate properties was 12.25 years. During the second quarter of 2018, the Company sold four real estate properties, consisting of two data centers for an aggregate sale price of $85.0 million, which generated net proceeds of $83.3 million, and two healthcare properties for an aggregate sale price of $3.2 million, which generated net proceeds of $3.0 million. Year-to-date, the Company sold six real estate properties, consisting of four data centers for an aggregate sale price of $227.5 million, which generated net proceeds of $223.4 million, and two healthcare properties for an aggregate sale price of $3.2 million, which generated net proceeds of $3.0 million. On July 25, 2018, the Company sold its remaining data center, the Andover Data Center, for $15.0 million, which generated net proceeds of $14.6 million. As a result of the sale, the Company completed the monetization of all its data center assets and fulfilled its strategy to seek liquidity for the data center portfolio. The Company realized $1.3 billion in net proceeds and achieved an approximately 10.5% unleveraged internal rate of return on the sale of its data center portfolio. In August 2018, the Company, through its wholly-owned subsidiary, entered into a Lease Termination and License Agreement with Bay Area, which terminated the lease and granted Bay Area a non-assignable license (the “License”) to access the property for the sole purpose of winding down its administrative operations. The License may be terminated by either party with 30 days' notice to the other party and Bay Area's lender. Excluding Bay Area, the Company’s weighted average occupancy rate was 77% and the weighted average remaining lease term was 11.5 years at June 30, 2018. On August 10, 2018, the Company entered into a non-binding letter of intent with an affiliate of the University of Texas System to lease the Bay Area Regional Medical Center property. On February 1, 2018, as a result of the sale of the majority of the Company's data center assets during December 2017 and January 2018, the Company entered into an amended and restated credit agreement related to the unsecured credit facility to remove one lender and to change the maximum commitment available under the unsecured credit facility to $400.0 million, consisting of a revolving line of credit, with a maturity date of May 28, 2019 (with one 12-month extension option). Subject to certain conditions, the unsecured credit facility can be increased to $750.0 million. All other material terms of the unsecured credit facility remained unchanged. On May 4, 2018, the Company repaid its outstanding mortgage note payable related to the Bay Area property, which had an outstanding principal balance of approximately $84.7 million at the time of repayment. As of June 30, 2018, the Company had total principal debt outstanding of $252.3 million, consisting of $42.3 million in notes payable and $210.0 million on the unsecured credit facility and a net debt leverage ratio, which is the ratio of principal debt outstanding less cash to total aggregate purchase price and additional capital expenditures of real estate assets and notes receivable, of 18%. The Company’s outstanding debt was comprised of 25% fixed rate debt (including debt fixed through the use of interest rate swaps) and 75% variable rate debt. At June 30, 2018, the Company had liquidity of $76.1 million, consisting of $37.8 million in cash and cash equivalents and $38.3 million in borrowing base availability on the unsecured credit facility. On August 13, 2018, the Company entered into the first amendment to the amended and restated credit agreement to amend certain financial covenants as a result of Bay Area experiencing financial difficulty. As of the date of this release, the Company is in compliance with the covenants of the first amendment to the amended and restated credit agreement. On August 23, 2018, the Company increased the borrowing base availability under the unsecured credit facility by approximately $61.2 million by adding one healthcare property and a portfolio of 17 healthcare properties to the aggregate pool availability. Included in this earnings release is the Second Quarter Portfolio Update, which includes certain supplemental information about the Company’s real estate portfolio and financial results as of and for the three and six months ended June 30, 2018. The Second Quarter Portfolio Update contains certain non-GAAP supplemental metrics that are not defined by GAAP, including FFO and MFFO, which are described in “Use of Non-GAAP Information.” Reconciliations to their most directly comparable GAAP measures are provided in the Second Quarter Portfolio Update. Net operating income, a non-GAAP financial measure, is defined as total revenues, less rental expenses, which excludes depreciation and amortization, general and administrative expenses, acquisition related expenses, asset management fees and interest expense, net. The Company believes that net operating income serves as a useful supplement to net income because it allows investors and management to measure unlevered property-level operating results and to compare operating results to the operating results of other real estate companies between periods on a consistent basis. Net operating income should not be considered as an alternative to net income determined in accordance with GAAP as an indicator of financial performance, and accordingly, the Company believes that in order to facilitate a clear understanding of the consolidated historical operating results, net operating income should be examined in conjunction with net income as presented in the condensed consolidated financial statements and data included on the Company’s Quarterly Report on Form 10-Q filed with the SEC on August 14, 2018. One of the Company ’s objectives is to provide cash distributions to its stockholders from cash generated by the Company’s operations. The purchase of real estate assets and real estate-related investments, and the corresponding expenses associated with that process, is a key operational feature of the Company’s business plan in order to generate cash from operations. Due to certain unique operating characteristics of real estate companies, the National Association of Real Estate Investment Trusts, or NAREIT, an industry trade group, has promulgated a measure known as FFO which the Company believes is an appropriate supplemental measure to reflect the operating performance of a REIT. The use of FFO is recommended by the REIT industry as a supplemental performance measure. FFO is not equivalent to the Company’s net income as determined under GAAP. The Company defines FFO, consistent with NAREIT’s definition, as net income (computed in accordance with GAAP), excluding gains (or losses) from sales of property and asset impairment write-downs, plus depreciation and amortization of real estate assets, and after adjustments for unconsolidated partnerships and joint ventures. Adjustments for unconsolidated partnerships and joint ventures will be calculated to reflect FFO on the same basis. The Company, along with others in the real estate industry, consider FFO to be an appropriate supplemental measure of a REIT’s operating performance because it is based on a net income analysis of property portfolio performance that excludes non-cash items such as depreciation and amortization and asset impairment write-downs, which the Company believes provides a more complete understanding of its performance to investors and to its management, and when compared year over year, reflects the impact on the Company’s operations from trends in occupancy. Publicly registered, non-listed REITs, such as the Company, typically have a significant amount of acquisition activity and are substantially more dynamic during their initial years of investment and operations. While other start-up entities may also experience significant acquisition activity during their initial years, the Company believes that publicly registered, non-listed REITs, like the Company, are unique in that they have a limited life with targeted exit strategies within a relatively limited time frame after the acquisition activity ceases. The Company's board of directors will determine to pursue a liquidity event when it believes that the then-current market conditions are favorable. Thus, the Company will not continuously purchase real estate assets and intends to have a limited life. Due to these factors and other unique features of publicly registered, non-listed REITs, the IPA has standardized a measure known as modified funds from operations, or MFFO, which the Company believes to be another appropriate supplemental measure to reflect the operating performance of a publicly registered, non-listed REIT. MFFO is a metric used by management to evaluate sustainable performance and dividend policy. MFFO is not equivalent to the Company’s net income as determined under GAAP. The Company defines MFFO, a non-GAAP measure, consistent with the IPA’s definition in its Practice Guideline: FFO further adjusted for the following items included in the determination of GAAP net income; acquisition fees and expenses; amounts related to straight-line rental income and amortization of above and below intangible lease assets and liabilities; accretion of discounts and amortization of premiums on debt investments; mark-to-market adjustments included in net income; nonrecurring gains or losses included in net income from the extinguishment or sale of debt, hedges, foreign exchange, derivatives or securities holdings where trading of such holdings is not a fundamental attribute of the business plan, unrealized gains or losses resulting from consolidation from, or deconsolidation to, equity accounting, adjustments related to contingent purchase price obligations where such adjustments have been included in the derivation of GAAP net income, and after adjustments for a consolidated and unconsolidated partnership and joint ventures, with such adjustments calculated to reflect MFFO on the same basis. The Company’s MFFO calculation complies with the IPA’s Practice Guideline, described above. In calculating MFFO, the Company excludes amortization of above and below-market leases, amounts related to straight-line rents (which are adjusted in order to reflect such payments from a GAAP accrual basis to closer to an expected to be received cash basis of disclosing the rent and lease payment), the adjustments related to contingent purchase price obligations, ineffectiveness of interest rate swaps and the adjustments of such items related to the Company's noncontrolling interests. The other adjustments included in the IPA’s Practice Guideline are not applicable to the Company. (1) Under GAAP, certain intangibles are accounted for at cost and reviewed at least annually for impairment, and certain intangibles are assumed to diminish predictably in value over time and are amortized, similar to depreciation and amortization of real estate-related assets that are excluded from FFO. However, because real estate values and market lease rates historically rise or fall with market conditions, management believes that by excluding charges related to amortization of these intangibles, MFFO provides useful supplemental information on the performance of the real estate. (2) Under GAAP, rental revenue is recognized on a straight-line basis over the terms of the related lease (including rent holidays, if applicable). This may result in income recognition that is significantly different than the underlying contract terms. By adjusting for the change in deferred rent receivables, MFFO may provide useful supplemental information on the realized economic impact of lease terms, providing insight on the expected contractual cash flows of such lease terms, and aligns with our analysis of operating performance. (3) Of this amount, $231,000 related to straight-line rents and $192,000 related to above- and below-market leases. Carter Validus Mission Critical REIT, Inc. currently qualifies as a real estate investment trust and invests in mission critical real estate assets located throughout the United States. Mission critical real estate assets are purpose-built facilities designed to support the most essential operations of tenants. As of June 30, 2018, the Company owned 31 real estate investments, consisting of 62 properties located in 33 MSAs across the United States. As of June 30, 2018, the Company's data center portfolio consisted of one property and its healthcare portfolio consisted of 61 properties with a diversified focus, including medical office buildings, specialty surgical centers, and hospital properties. This release contains certain forward-looking statements within the meaning of federal securities laws and regulations. Because such statements include risks, uncertainties and contingencies, actual results may differ materially from those expressed or implied by such forward-looking statements and you should not place undue reliance on any such statements. A number of important factors could cause actual results to differ materially from the forward-looking statements contained in this release. Such factors include those described in the Risk Factors sections of Carter Validus Mission Critical REIT, Inc.’s annual report on Form 10-K, quarterly reports filed on Form 10-Q and other reports filed with the Securities and Exchange Commission. Forward-looking statements in this document speak only as of the date on which such statements were made, and the Company undertakes no obligation to update any such statements that may become untrue because of subsequent events. Such forward-looking statements are subject to the safe harbor protection for forward-looking statements contained in the Private Securities Litigation Reform Act of 1995.